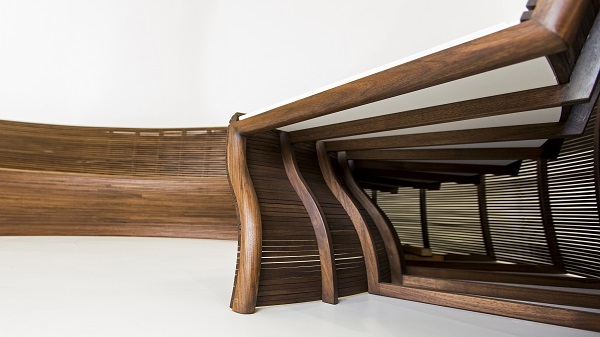 As if the Spirit 111 wasn’t going to be eye-catching enough, the custom, hand-made saloon seating provides a clue as to what she might look like down below. Currently undergoing interior fit out, the Spirit 111 is on track to launch next summer. With her coachroof recently fitted, a peak through the fan windows reveals curved internal walls and intricate features. 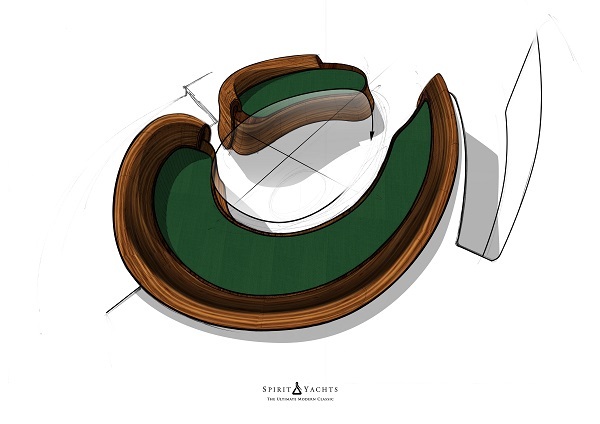 The bespoke seating and bed heads for the Spirit 111 are being built by Will Fennell and Ben Jackson; both former employees of Spirit Yachts, who have teamed up with the company on this landmark project. 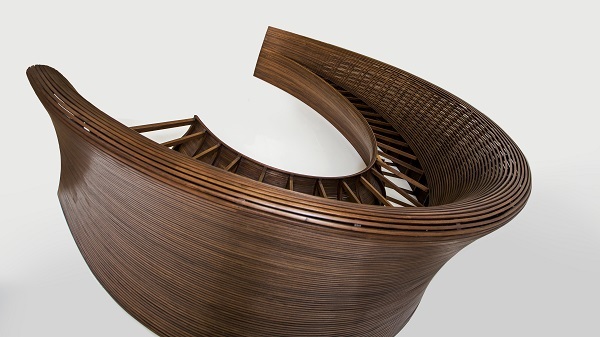 Designed and developed by Spirit Yachts, the first of a two-part seating arrangement is made out of strips of 10mm x 10mm American Walnut, which in total length reach 1.2km. 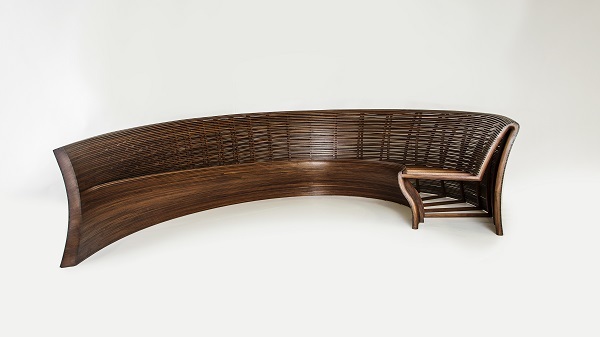 The sofa, which took over 1,000 man hours to build by hand features sweeping curves to complement the ebb and flow of the seamless wooden interior designed by Rhoades Young. 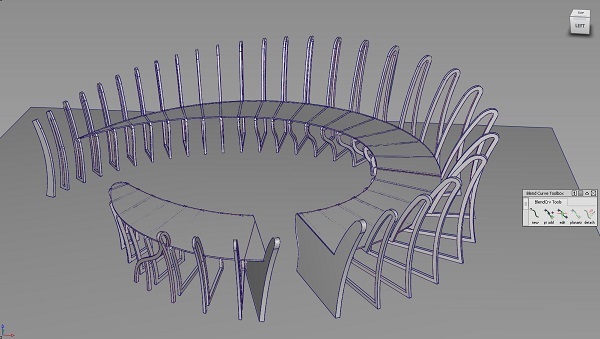 Above: early drawings of the seating, showing the two pieces in relation to each other. Above: initial hand drawings by Spirit Yachts then became 3D graphics. Away from the interior, Spirit Yachts can announce that the contract for the 111 sail wardrobe has been awarded to OneSails GBR (East). Having pitched against competition from other sail makers, OneSails GBR (East) will be supplying a wardrobe of high performance, three dimensional, recyclable sails including a mainsail, jib, staysail, FFR flat furling reacher and a furling asymmetric. 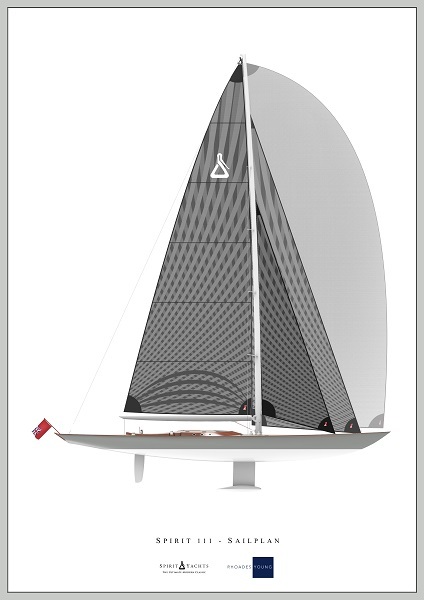 The sails will be fitted to a Hall Spar carbon fibre mast and in-boom furling to facilitate short-handed sailing. The sail membranes will be fitted with electronic chips that record data, which can then be used to help optimise sail performance, a feature that will come into its own during Mediterranean superyacht regattas. Next steps for the Spirit 111 will be to fit the coachroof and finalise the cockpit. Keep an eye on Spirit Yachts’ Facebook and Instagram pages for the latest images from the build.